The "Lite and E-Z" is a step-in style harness and leash by Midnight Pet, made from parachute-weight cord. Unlike the vast majority of paracord pet gear, these are made from a single strand of cord so they are incredibly light. The harness is super easy to adjust, and simple in design. It's significantly less confusing than the average step-in harness. They come in a variety of colors, and five different sizes. Midnight Pet recommends them for ferrets, rabbits, cats, iguanas, puppies, and of course tiny dogs. The leash comes in 3', 4' and 6' lengths. I love this harness so much that I rarely use anything else on Ru. The leash is super thin and tiny and really enhances that rat-on-a-string look. It would probably also work well as a show lead, and is strong enough that I've used the loop end to make a slip lead for catching loose dogs. The Lite and E-Z harness is minimalist enough for fashionistas like Ru. When he isn't wearing his Yap Wrap coat, I like to have something fabulous on him. He is usually on a leash, and I love having a harness that lets his outfit shine. We had to do these pictures with him undressed because the harness blends so flawlessly with whatever he is wearing. The hardware used on these products is so light, it's practically jewelry. The top of the harness stays centered and never slides to the side. The fit always seems perfect, whether Ru is wearing a thick puffy jacket or going au naturel. I bought these at the Pet House in Goleta, and I didn't realize that the metal slides under the rings adjusted until I saw the Midnight Pet website while writing this post. We actually have two of these, the one shown is Grape, and the other is Raspberry colored. I bought the second when I had a chihuahua foster dog and found I couldn't live without it. The pink set was purchased a couple of years before the purple, and the leash was sometimes difficult to unclip from the harness. 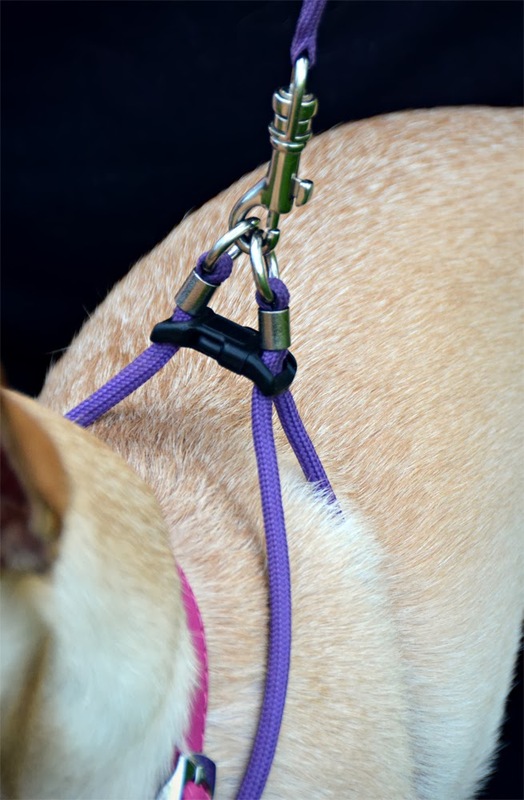 I was extremely pleased to see that the purple harness has slightly thinner rings, and the leash a slightly larger clip. Pros: Super light, minimalist harness that is very easy to use and simple to adjust. Light enough to stay in place and not rotate around the dog. Works beautifully over clothes. Holds up well on hikes and other adventures, with no signs of wear to date. Totally comfortable, the dog barely notices it. Very affordable, I think I paid around $25 for a harness and 6' leash. 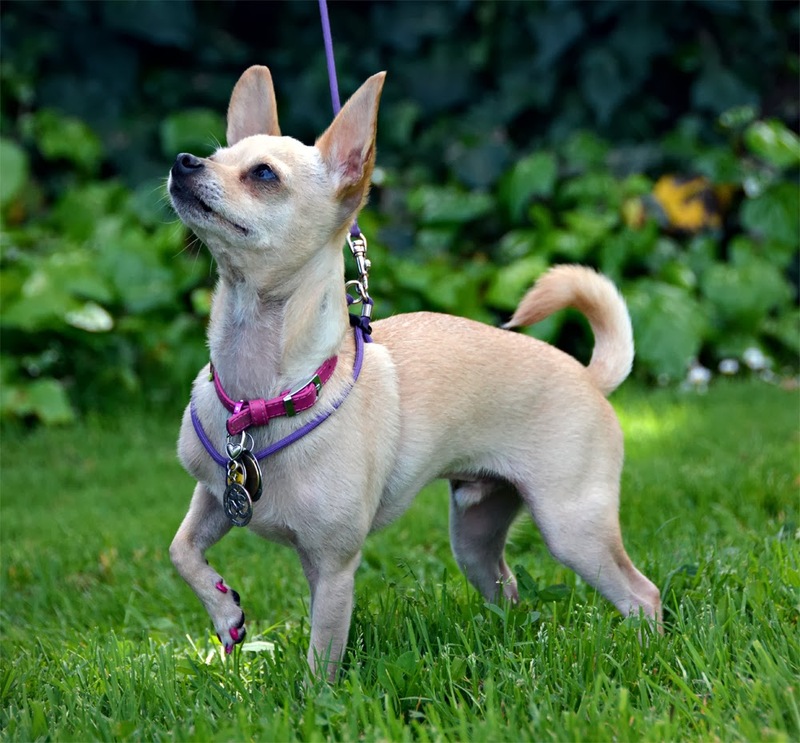 Cons: The super-thin leash could be uncomfortable to hold on a dog that generates any sort of pulling power. I'm not sure how well it would stand up to chewing. My pink one is starting to look a little dirty after a few years, I should probably try washing it. Bottom Line: I use this every single day and constantly tell people where I got it. If it were to fail spectacularly tomorrow, I would immediately go out and buy another one.